THE ORIGINAL SOUTHERN A.P.A. was organized in Baltimore in August, 1872. Edwin K. Canby, of that city, editor of the Baltimore Amateur, was chosen President, and Henry L. Bryan, of Washington, one of the editors of the Washington Amateur Magazine, Treasurer. A committee was appointed to draft a constitution and to report at a meeting in Washington in September. At that meeting the Washington amateurs were in a large majority and ended the Baltimore reign of Canby. Will H. Dennis, of Washington, editor of the Boy of the Period, was made President, but James S. CaIwell, of Baltimore, editor of the Southern Star, one of the leading amateur journals of the country, was given the office of Treasurer. On Christmas Day a meeting held in Baltimore, with an elaborate dinner, was a highly enjoyable social occasion. In 1874 John Winslow Snyder was elected President, but the Association after this was allowed to lapse. A Southern A.P.A. was organized in 1888 at San Antonio, Tex., but it did not survive. 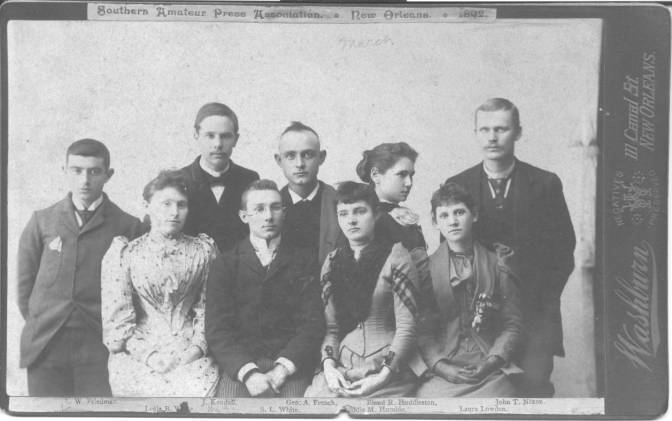 The Southern Amateur Press Association was reorganized in March, 1872, at New Orleans, with John T. Nixon as President, it continued until 1896. Pictured in the above photograph, taken in New Orleans in 1892, are (left to right) W. Friedman, Leola B. [last name unknown], J. Kendall, S. L. White, George A. French, Liddie M. Humble, Bland R. Huddleston, Laura Lowden, and John T. Nixon.